As the economy expands and inflation ticks up in the post-election world, fueled by a pledge by President Trump to increase fiscal spending with improvements to America’s crumbling infrastructure, market participants will have to keep in mind the negative effects of increasing prices. They may want to consider hard-asset-related investments to help maintain the purchasing power of their portfolios. Stocks of companies in natural resource industries such as industrial materials, agriculture, and energy can potentially help market participants mitigate inflation, as these stocks may directly benefit from increases in the underlying prices. 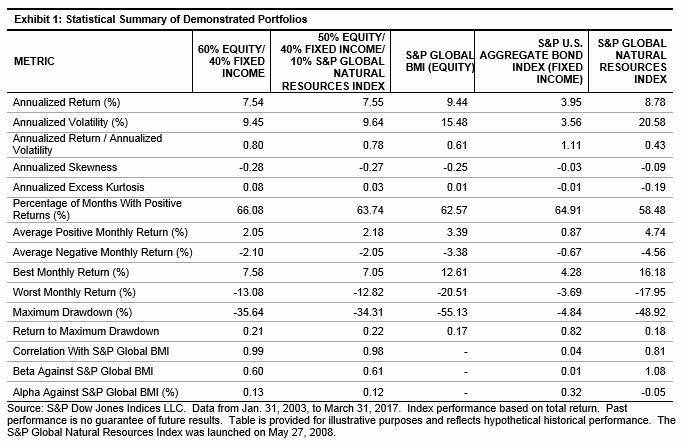 Over the 14–year period ending Feb. 28, 2017, the S&P Global Natural Resources Index, which is designed to provide market participants with an equity-based approach to natural resource investments through its three commodity-related sectors (agribusiness, energy, and metals & mining), has outperformed the S&P Global BMI by a monthly average of 36 bps in high-inflation months. The index has underperformed the S&P Global BMI by 29 bps in low-inflation months (see Exhibit 1). Therefore, for market participants seeking to harness these inflationary trends, carving out a portion of an equity allocation for global natural resource stocks may warrant consideration. Exhibit 2 illustrates how the characteristics of a conventional 60% equity/40% fixed income portfolio is affected by the addition of the S&P Global Natural Resources Index. The decline of the S&P Global Natural Resources Index at the start of 2015 did have a negative impact on the portfolio performance, but it has been steadily increasing since January 2016.